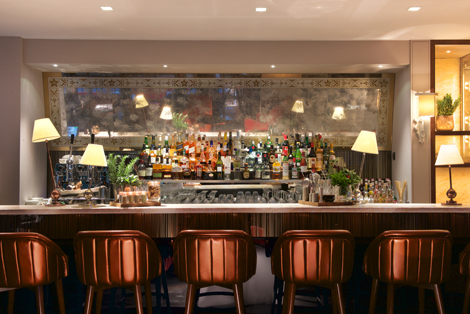 Restaurant group D&D London reopened its Italian restaurant on Savile Row in December with a new chef patron – Francesco Mazzei, formerly of L’Anima in the City – and fully refurbished interiors. 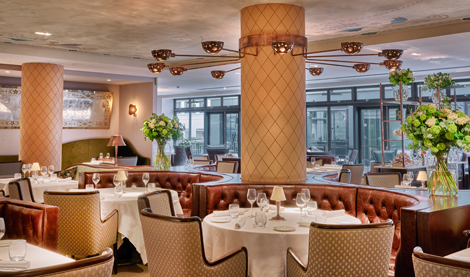 D&D’s other restaurants in the capital include Quaglino’s (reviewed here), Coq d’Argent, Le Pont de la Tour (reviewed here), Sauterelle (reviewed here) and the new German Gymnasium (reviewed here). Interior designer David d’Almada – who has previously worked on the Arts Club on Dover Street – was inspired by classic Italian style and the restaurant’s Savile Row location, using luxurious leathers, silks and velvets in the soft furnishings. It’s chic and immediately inviting – the place had a delightfully warm buzz on the cold January evening we stepped in. A new bar, Libare, has been installed at the front of the venue, with high stools to sit up and enjoy a drink or one of the various luscious-looking salads on display on the cicchetti counter, plus lounge seating. There is a list of Italian cocktails – my Zucca Bar (Professor Cornelius Old Tom gym, Carpano Punt e Mes and Rabarbaro Zucca, £9.50) was deep, smoky and potent. Fat, creamy Nocellara olives and zingy amuse-bouches were offered. More than a place to have an aperitif, it’s somewhere you could easily grab a light lunch, or drop in for a drink in classy surroundings – welcome in an area where many of the options tend to be expensive hotel bars or packed boozers. There’s also an outdoor terrace along the Old Burlington Street side of the building. The dining room is located at the far end and is classically elegant, with warm lighting, thick carpeting, large orchid displays, well-spaced tables dressed in crisp white linens, and plush seating. There are also two private dining rooms seating up to 25 people in each, which can be combined to accommodate 50. Mazzer’s all-day dining menu includes dishes from his native Calabria – including some signatures from his L’Anima tenure – as well as other regions in Italy. The antipasti section lists the likes of hand-cut Black Angus beef with pickled truffle and anchovies (£11.50) and crab salad “pizzaiola” (£18.50), but following excellent bread and olive oil, we dove straight into the primi selection. 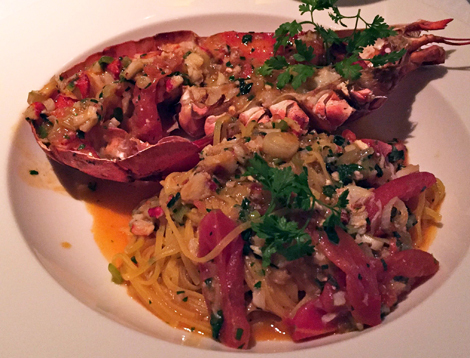 I had the lobster tagliolini (£26.50), which was exquisite – fragrant, plump chunks of lobster served in the shell with sweet broth and delicate ribbons of pasta. 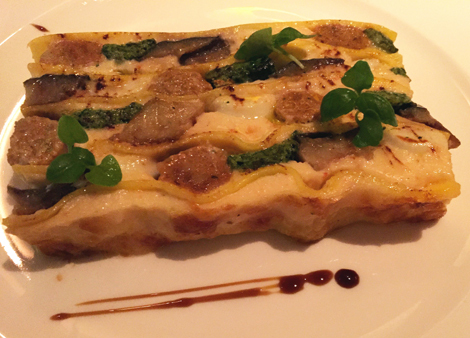 My companion had the southern Italian lasagne (£15.50), which he declared to be “incredible” – like a terrine, it had flavour-packed layers of sausage, aubergine and quail’s egg. For my main, I opted for home-cured baccala (salt cod) marinated in liquorice (£26.50) – again, beautiful. 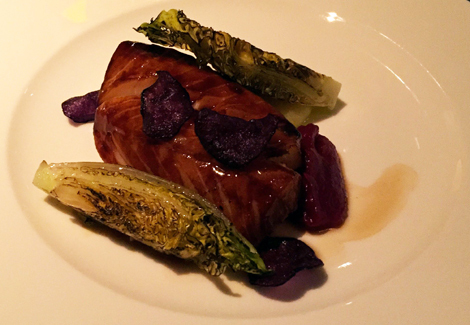 Firm, flaky fish, the subtle bitterness of its marinade balanced by the accompanying sweet beetroot puree and smoky charred lettuce. My companion went for the Black Angus beef tagliata (£29), which was generous in size and perfectly seasoned and cooked. An overflowing portion of light, crispy courgette fritters (£6) was an addictive side, and my dessert of bergamot cream (£7.50) was a suitably silky end to my meal. The wine pairings suggested for our courses were superb, and done with a real understanding of the regions the bottles were from, and their composition. Attentive without being intrusive; warm and knowledgeable. 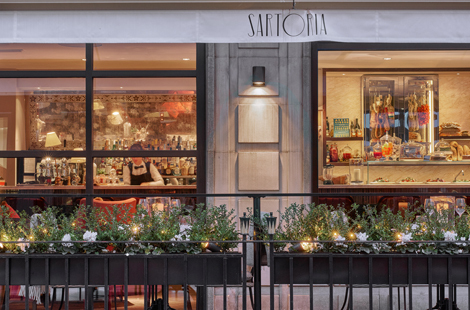 A splendid relaunch for Sartoria – gorgeous food and immaculate service in an elegant setting. Treat yourself the next time you’re in Mayfair. OPENING HOURS 7am-12am Mon-Fri, 9am-12am Sat. PRICE Starters £9.50-£26.50; mains £16.50-£29; sides £4.50-£6; desserts £7.50-£11. Set lunch: two courses £26.50; three courses £32.50. Wines from £5 by the glass; from £18 by the bottle.